It's always a good thing when you fly to have no issues and yesterday's flight was smooth as can be. The highlight was the lady ahead of me getting off the plane in Paris was Mila Kunis who turned around thinking I was her assistant asking me for her passport. She then had the look of disappointment before spotting her assistant was way behind me. I just smiled and moved out of the way, thankful I resisted the urge to ask where she got her coat (I was admiring it before I knew who was wearing it and almost did ask). Also I was desperate to get some tasty French coffee before catching our flight to Amsterdam. I tend to be a disappoint in the celebrity realm and it reminded me of the time I was working the US Open tennis in New York. After closing up our hospitality suite in Manhattan I took the extra car (limo) to the stadium. We had a suite at the stadium and used the VIP entrance which is also used by celebrities so when we pulled up all the photographers were ready and then it was just me. There was actually an audible disappointed groan from them. Good thing I think I am pretty awesome otherwise I might end up with a complex. Anyway you can see the coat here, but I have yet to find it in an online shop although admittedly I have only been up for a few hours and am a little jet lagged so the brain may be a little slow to catch up. 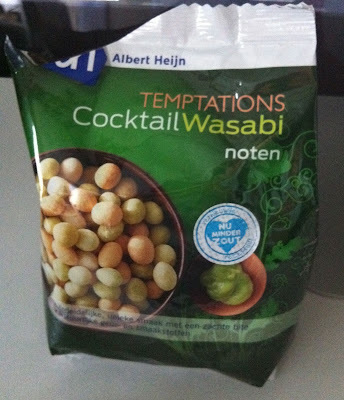 I did however manage to get out of the house to pick up my favorite snack in the Netherlands, cocktail wasabi noten. They are basically peanuts wrapped in a mini cracker like substances and are as addictive as crack. I also believe the walk to store was exercise enough to eat the whole bag. Everyone wins.